2017: A few years ago I posted the map below, but I’ve since traveled to a few additional states and thought I should probably update it! I love seeing where I’ve traveled and seeing what’s left to visit! 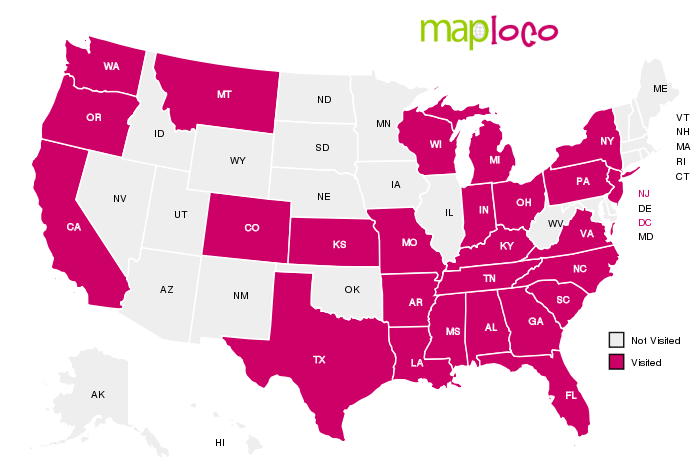 I still have at least 24 more states to go! 2014: A map has been circulating through Facebook recently that lets you mark the various states you’ve visited in the U.S. So naturally I had to give it a whirl! I can’t believe the number of places I’ve visited thanks to my job. When I first took the job I knew that some traveling was part of the description. I just didn’t realize how many places I’ve been to over the years! Looks like now I have a goal to meet on what places I need to visit. Mom – did we travel through New Mexico, Arizona, Utah, and/or Nevada on our way to California when I was little? I suppose I should mark them on the map as well, but if I don’t remember visiting, should I even bother?